Timer is basically used to monitor an event at defined intervals and control the event or process. For instance, users use a timer to time the animation of a slideshow, show periodic progress while doing exercise, etc. Users with programming knowledge can easily create a computer timer app customized to their needs. Recently we came across a very interesting timer, TiTimer. It doesn’t feature fancy functions but the interface is nicely designed and the alert sound is nice. 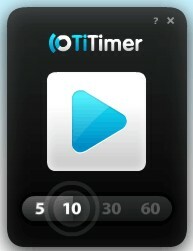 TiTimer offers 5, 10, 30, 60 seconds interval for users. If users tick the 5 seconds interval, the timer will alert users at every 5 seconds interval. If users tick 5 seconds and 10 seconds, the timer will alert users at every 5 seconds and 10 seconds. Of course, if users tick 5, 10 and 30 seconds, the time will alert users at every 5, 10 and 30 seconds. TiTimer is free and compatible with all Windows Operating System. Since it allows only up to 60 seconds interval, it might not be suitable for many users. However, if you feel bored and sleepy while listening to your big boss or lecturer delivering his speech in front, probably you can download Titimer via the link here and use it to have some fun. Keep down the volume though.